Em Stafrace| Just a Girl with Ideas: A BLOG HOP WITH A DIFFERENCE! Hi Everyone welcome to my blog! Sue is such a fabulous scrapper, how she finds the time at all amazes me given she is a busy mumma. When Sue shares her latest creation does they are sensational. She is a master of colour and her versatility in creating with different styles is amaze ball! If you are not familiar with her work check out her fabbo blog 'Look into my Life' right HERE. The gist of this hop is to share a little about your crafting/scrapping arty process and to introduce people that inspire you. You may already be familiar with teh ladies I have picked but seeing their work through another persons eye often reveals more about them and their work. You can see who inspires me at the bottom of this post I am sure you'll find them equally as amazing as I do! 1.What I am working on now. 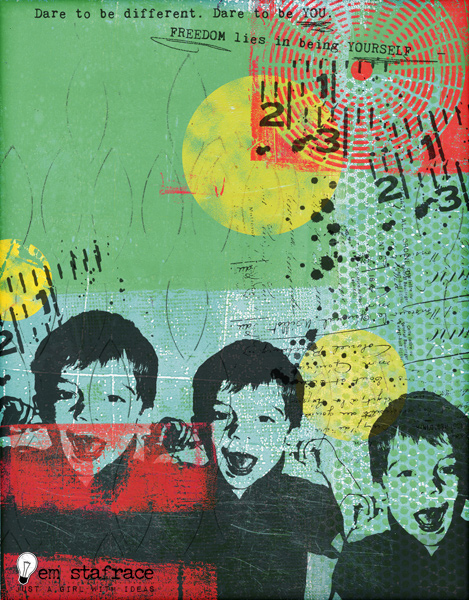 Aside from my Graphic Design commission work, I've been having lots of fun playing with my latest arty acquisition the Gelli Plate. Let me tell ya, revisiting my Art School days as a Printmaking Major has been quite cathartic and the fuel to fire up my arty mojo again. I now make a point of stealing an hour every now and then from my commission work to play creatively. This is my reprieve from the confines of a client brief. The 'Gelli Plate' is definitely a tonne of fun and a great avenue to explore more. I am loving every single painterly texure that appears with each impression and pull, ooooh so many delicious textures and striations... I am in looooove with this slab of goo! Here are some of my latest collage prints. 2. How long does it take to create a layout? That really depends on my mood more than anything or if I have had that soup bowl of coffee or not! he he. 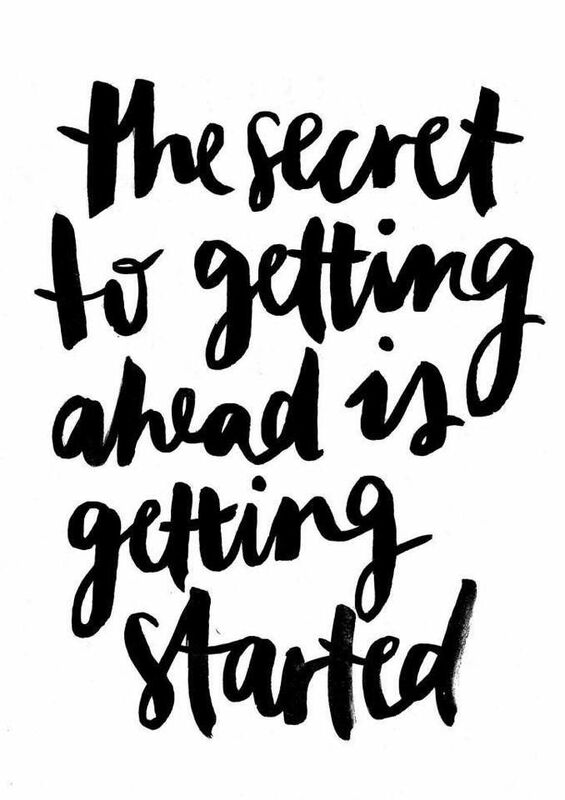 I am the worst procrastinator (ask my husband he's rolling his eyes right now), so it seems I have this inbuilt propensity to NOT getting the ball rolling, but once the mojo kicks in... boom I have finished a couple of pages and you can't stop me from creating more! I have to say this quote by Mark Twain has served me well in those lulls... it sits next to me at my desk and is a constant reminder to get cracking! 3. What are your favourite things to create with? Well okay so I have to say my Gelli plate is my favourite tool at this point in time, that's a given! A close second would be my gelatos and handcut stencils. 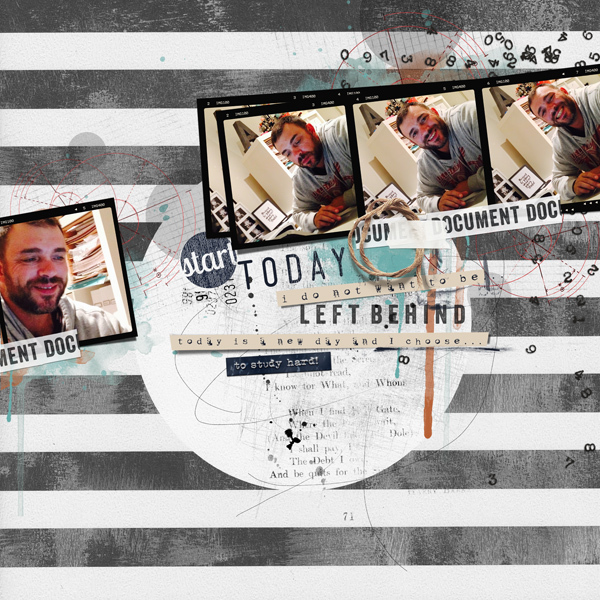 When it comes to my digital work I cannot work/live without my iMac, photoshop and some awesome digital kits created by these extra talented and creative peeps. That is so varied so its hard to pin down. I guess it depends on what I am working on at the time. If it's a commission I tend to work in stages making sure each step is signed off on by the client. This can be a bit fracturing creatively but a huge time saver and a necessary evil when working within a time frame. When I am creating DT projects I tend to work with the theme of the kit in mind. This can completely influence my decision on what photos to scrapbook and what story/ event or emotion I am wanting to convey. But then sometimes I might draw inspiration from the patterns or elements in the kit and completely wing it! 5. How do you become inspired or stay inspired? I also draw lots of inspiration from my daily life namely my sons antics. He provides me with an endless source of scrap-able matter lol. I also love the ups and downs in lifes journey, the ebbs and flows are a starting point especially for my art journal projects which I never share. That is something I have been asked many times and my answer is always different, thats because my style is always changing. I love to try different things and draw from many influences to create a page. I guess I would pigeon hole myself into an 'eclectic' slot, because I love to combine many different images and patterns together. I also love to cluster and group things tightly which stems from years working as a visual marketer dressing windows and creating instore displays. So here are my top 3 inspiring creative ladies check their blogs out by clicking on the images below I know you will be wowed just like I am! What can I say, this lady rocks! I love that Zeneva is both a traditional scrapper as well as a digital one, she a girl after my own heart! he he. I have known Zeneva for awhile now but when I discovered her stunning Gelli plate prints and her gorgeous Art Journal pages using them, I have become a regular visitor of her blog. She is so inspiring. 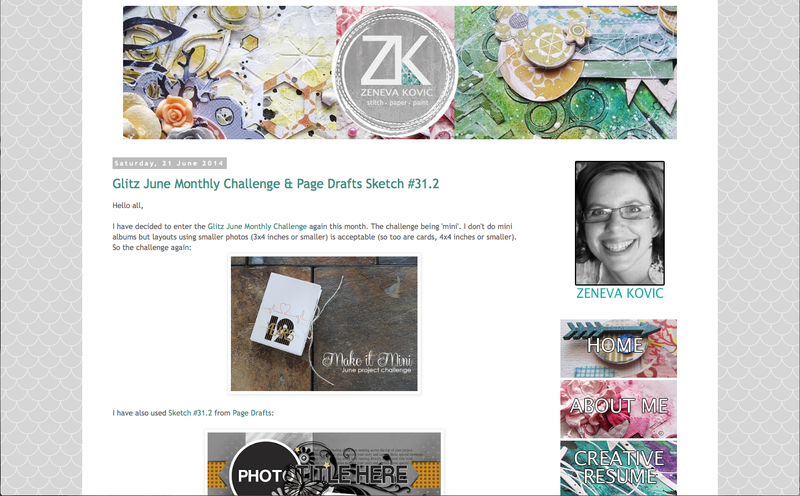 Check out her blog 'Zeneva Kovic- Stitch. Paper. Play' its filled with so much goodness you'll burst with inspiration! This city gal is one of the sweetest ladies I know. If ever I get to NYC (my dream vacay) I'll be sure to look her up for some serious creative play. I think Karla has a unique style. Her projects are so bold and bright but incredibly sensitive and delicate at the same time, quite a talent for combining the two successfully. She has a great way with colour combinations and a clever ability to scatter elements without them looking misplaced or floating out in neverland. I love that Karla uses the whole 12x12 space unlike myself who tends to squish everything up. I need to take a leaf from Kay's book on the art of loosening up lol! 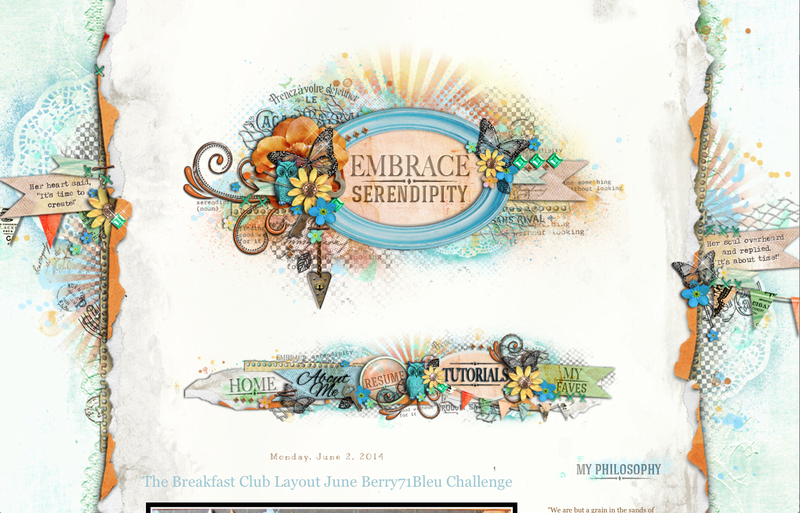 Check out her blog 'Embrace Serendipity' (which I designed btw he he) by clicking on the image below. This gorgeous soul was one of the first friends I made when I moved to the Gold Coast. We studied Interior Design together and remained friends over the years. 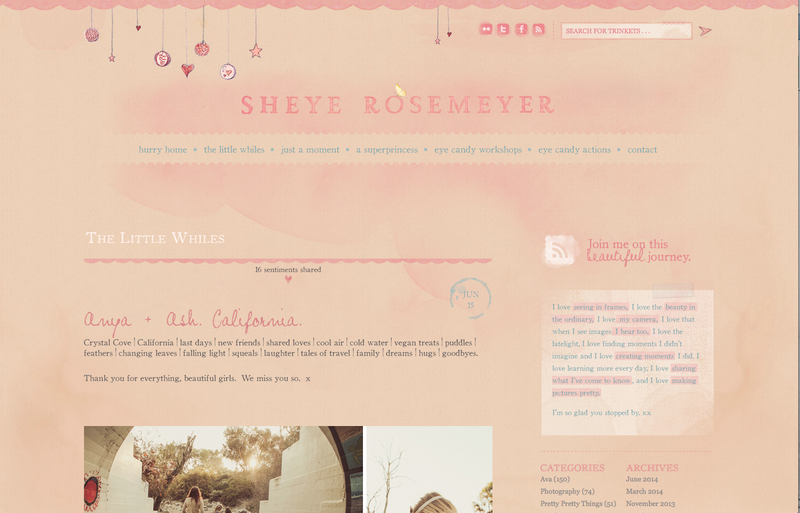 Sheye is an incredibly talented photographer and an insightful woman with a turn of phrase so succinct that when you read her blog 'Sheye Rosemeyer' she can uncannily drop you into the moment as though you were there with her. I have cried, laughed and rejoiced with her through her beautifully penned posts. Oh be still my beating heart! If you are a budding photographer or looking for a new lease on capturing those special moments in life you should check out Sheye's Explore or Evolve Eye Candy Workshops. They are a must do if you love soft milky vintage/retro inspired shots that are swathed in warm sun flare. Check the workshops out if you're interested in tapping into Sheye's immense knowledge. Sheye is currently on Maternity leave, but is taking expressions of interest for future workshops so be sure to drop her an email if you want to be updated on when the workshops will re-commence. Oh and for a little treat guess what... you can even purchase her stunning Eye Candy Actions to get that incredibly soft, vintage glow in your own work that Sheye is so famous for. So there you have it, a little peek into my world of crafting and who inspires me! So nice to read a bit more about you and your creative process! I am in awe of your digi creating! 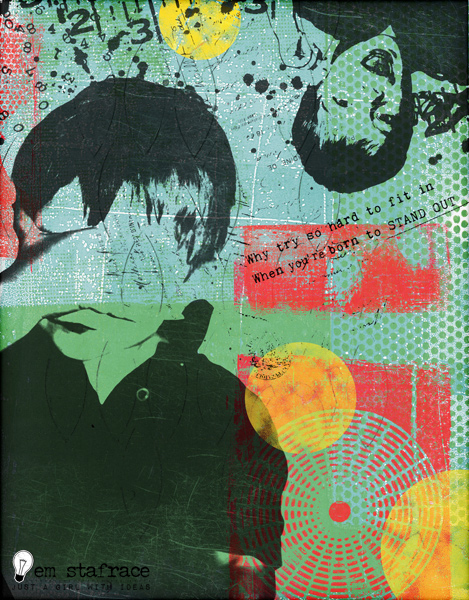 All I can say about those collage prints with the use of the gelli plate is W-O-W! It's just superb work. I truly enjoyed reading about you & in turn getting to know you just a little bit better. I appreciate your kind words & in letting me be a participant in this unique blog hop...let's continue to spread the creative love! 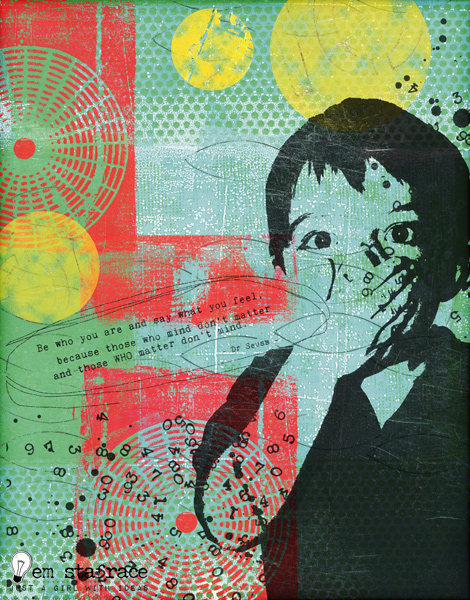 It sure is fun playing with the Gelli plate isn't it! Yes there is a Maltese connection. My father inlaw is from Malta and still has family living there. I would love to visit there one day, such a beautiful country!